Eleven -month- old Lucas Smith of Enfield picks out baby’s first pumpkin on October 26, 2013 at Brown’s Harvest in Windsor, CT. 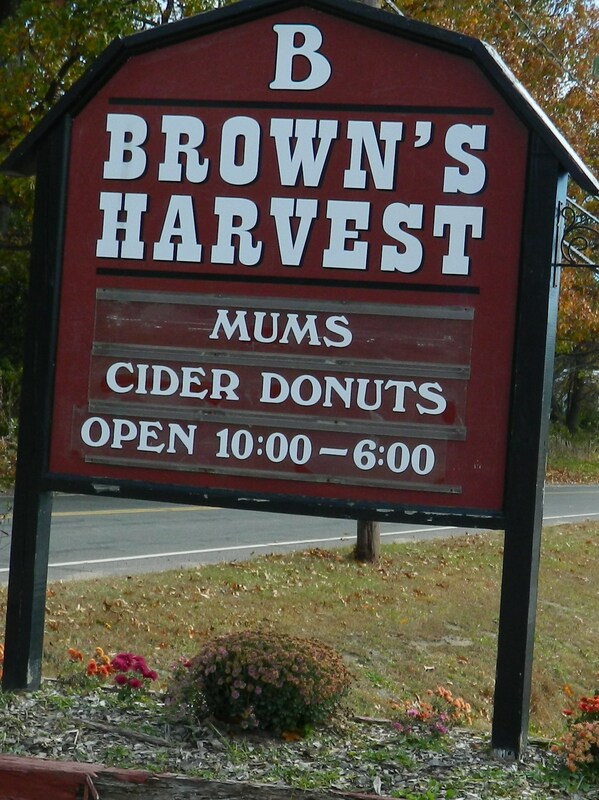 There could not be a more delightful destination this time of year then Brown’s Harvest in Windsor, Connecticut. 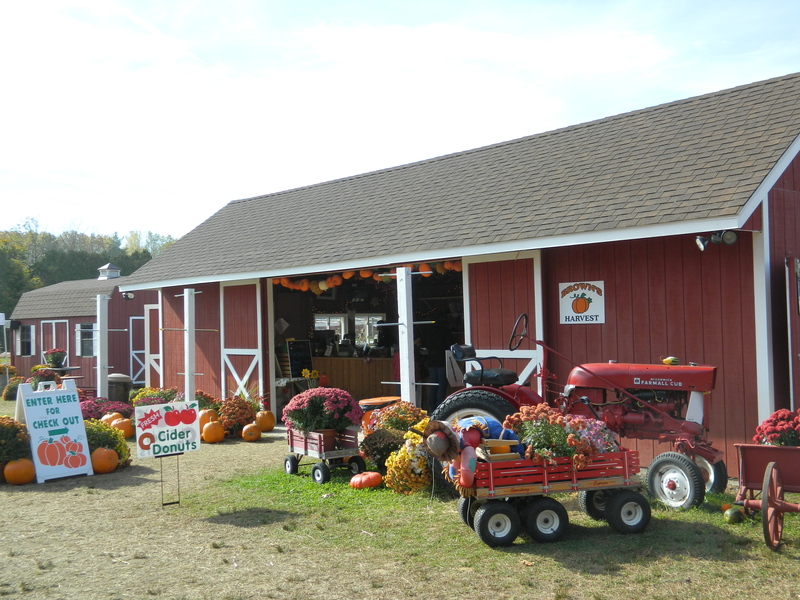 The pumpkin patch attracts visitors from throughout Connecticut and beyond. In fact, many people say an autumn stop at Brown’s is an annual tradition. 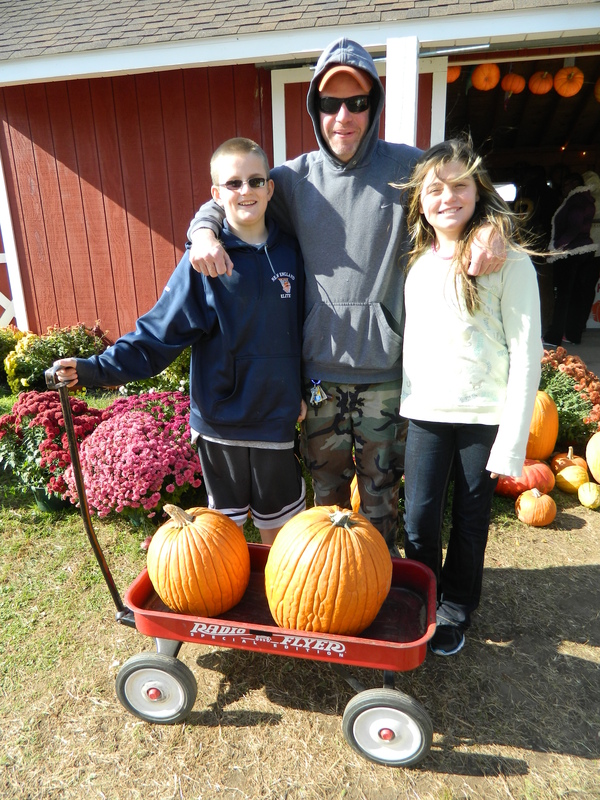 For the Massaro Family of Windsor Locks, -Zack, Rich & Lexi -Brown’s Harvest is an annual tradition. “I’ve been bringing them here since they were little tykes,” Rich Massaro of Windsor Locks said about his son and daughter Zack and Lexi during their October 26 visit to Brown’s. “I like the hayrides and picking out pumpkins,” noted Lexi. 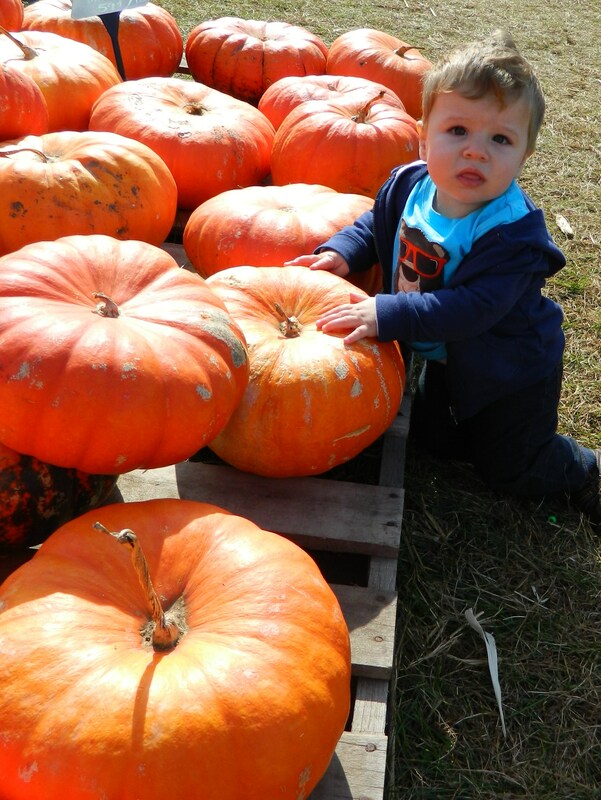 Eleven- month–old Lucas Smith’s parents live in Enfield and brought him to the farm to pick out baby’s first pumpkin. 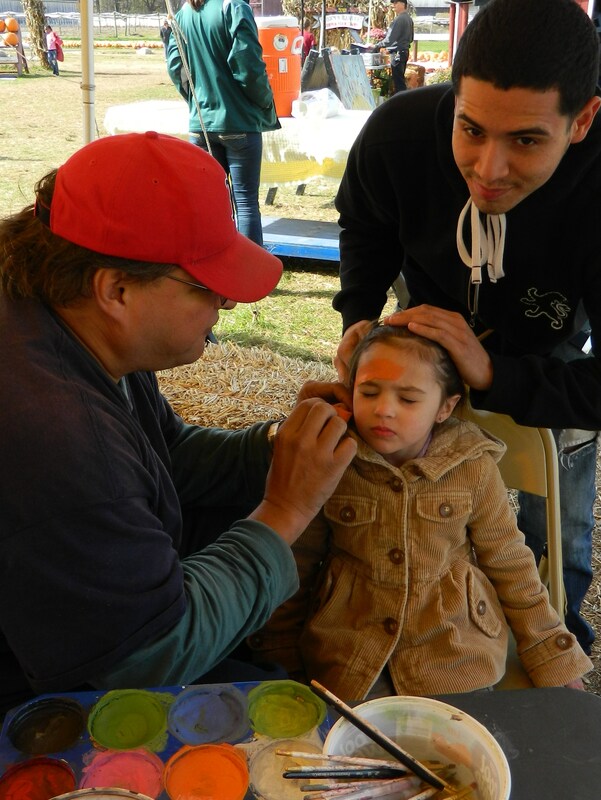 Meanwhile, Fernando of Manchester came with his 4-year-old daughter Makayla who was having her face painted like a pumpkin as daddy held her hair out of the way. 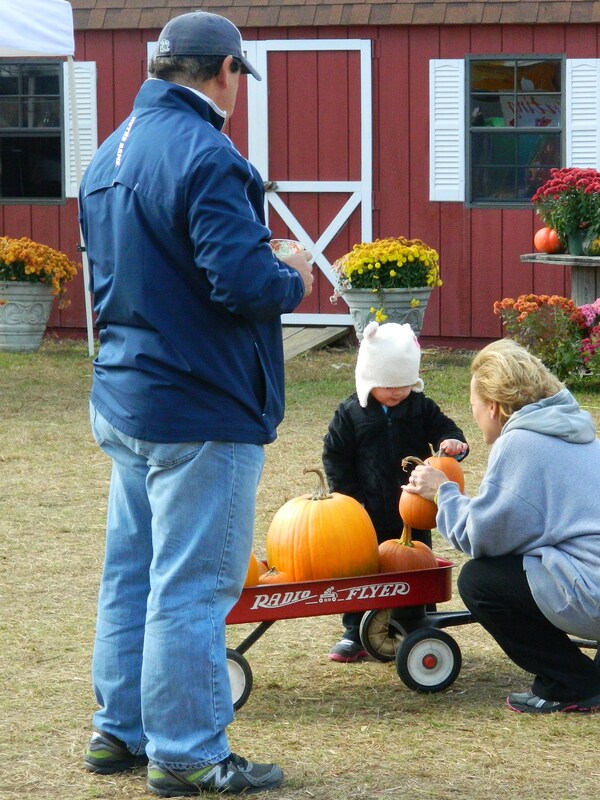 John Barbarotta drove up with his wife from Trumbull to bring their granddaughter Reese who lives in Windsor Locks to Brown’s – she had selected a wagon full of pumpkins that were eventually to be whittled down to a couple to take home. “It’s just pure fun here,” they agreed. Alex Connor, 15, is the sixth generation to work at her family farm, Brown’s Harvest in Windsor , CT.
Fernando of Manchester holds his daughter Makayla’s hair out of her face as Kevin Sterling paints on a pumpkin. The lovely, sunny and cool day had something for everyone . 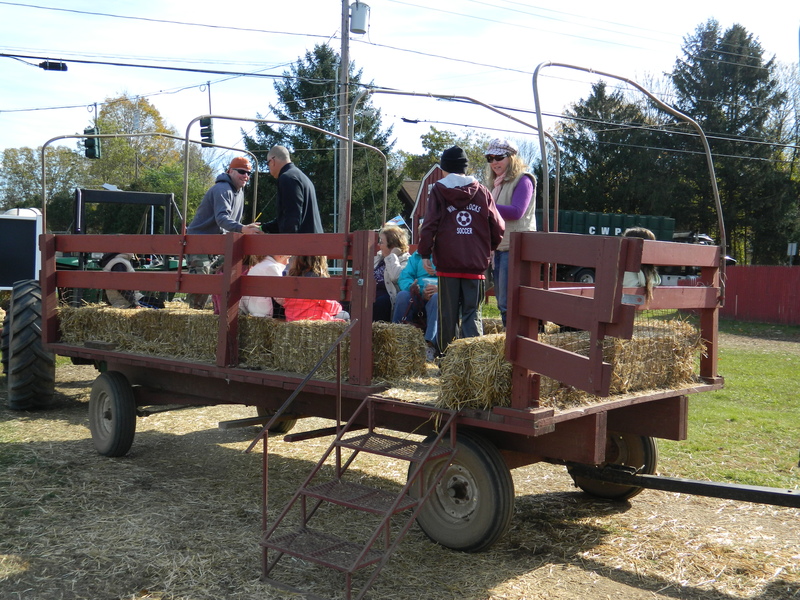 There were hayrides, and music and trivia games provided by a DJ posing questions like, where did jack-o-lantern’s originate? Answer- Ireland and they were first made from turnips and potatoes. In addition kids, big and small, enjoyed a large inflatable slide – although the wind threatened to shut it down on Saturday. 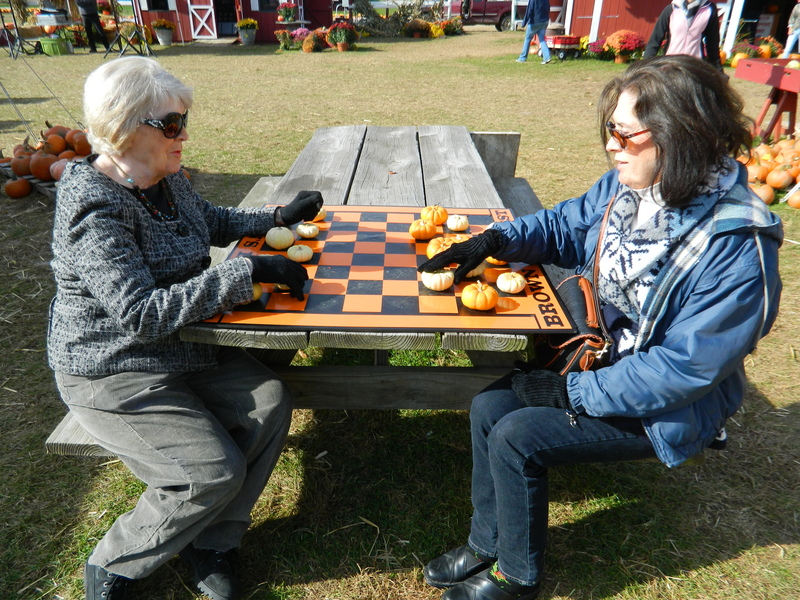 There were pumpkins and gourds galore, painted or plain, cornstalks, mums, apple cider, homemade apple cider donuts, as well as, Avon Mill cider, honey and fresh baked apple and pumpkin pies for sale. New this year Brown’s added a 5-acre Spookley Corn Maze for children in conjunction with Pacer.org to recognize October as bullying prevention month. John Barbarotta and his wife drove up from Trumbull to bring their granddaughter Reese to pick out a pumpkin or two. 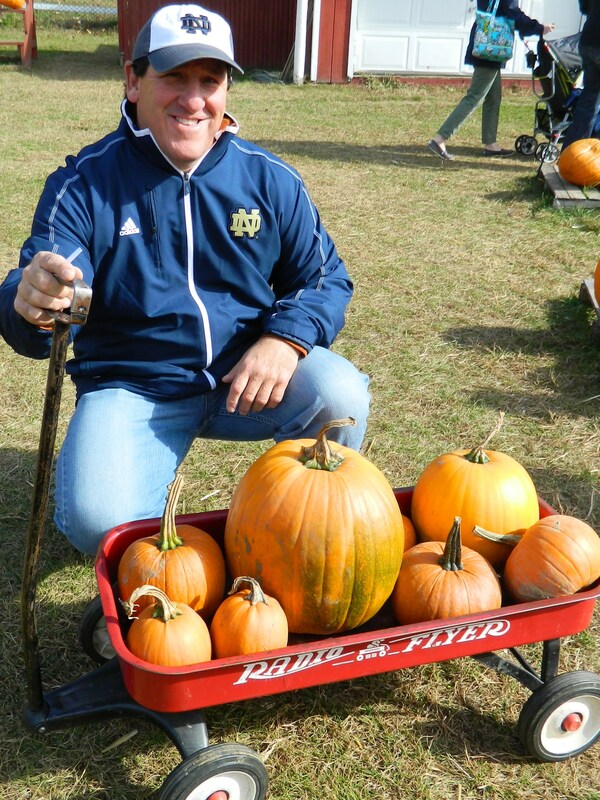 John Barbarotta shows the wagon full of pumpkins picked out by his granddaughter. Brown’s tobacco and pumpkin farm. 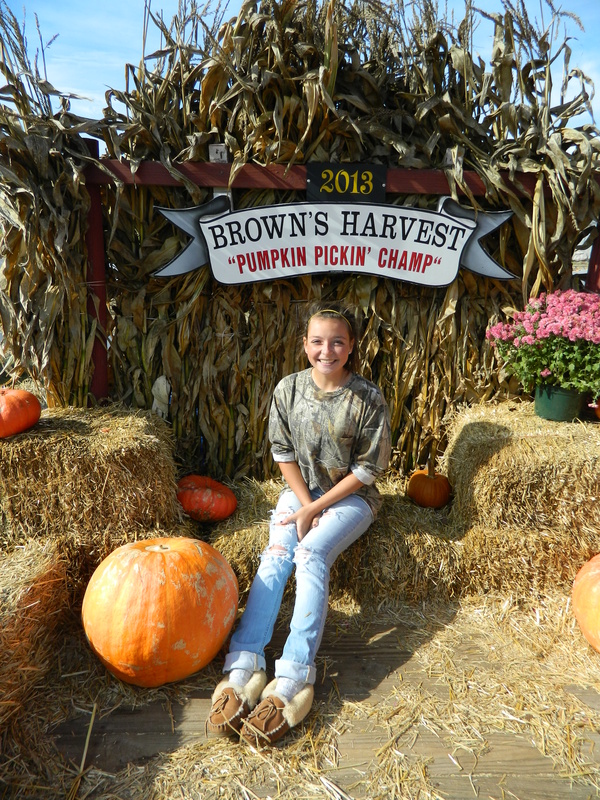 Fifteen-year-old Alex Connor, who attends Ethel Walker School in Simsbury, knows that she and her 12-year-old brother are the heirs apparent to the Brown Family Farm. “I grew up here,” she said. At this point, Alex wants to attend college and explore her options. But she said she is appreciative of having the family business to consider for her future. She points out her mother is young and fully expects her parents will be running the farm for many years to come. “Right now I’m just enjoying working with my parents, ” she said. Brown’s Harvest also supports worthy causes including Alex’s Lemonade Stand having raised $5,620 for the non-profit pediatric cancer foundation since 2007 and the Shriner’s Hospital, having raised nearly $4,600 for the hospital since 2008. 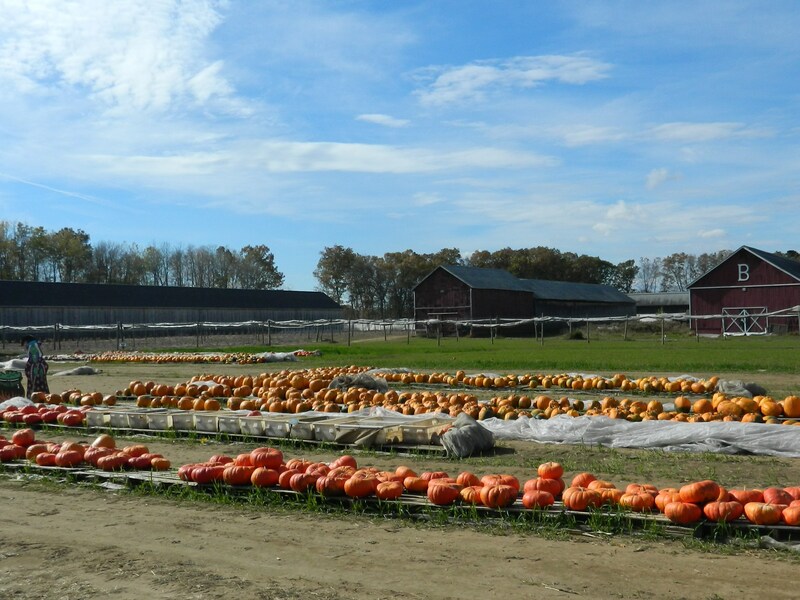 Located at 1911 Poquonock Avenue, Brown’s Harvest is open from 10 a.m. to 6 p.m. Call 860-683-0266 or visit their website for more information.